Mermaid Queen is a beautiful slot machine from Real Time Gaming. In this 5 reeler you’ll be introduced to a mythical underwater world filled with mermaids and other creatures of the deep. You may bet on 20 lines in this game and you trigger the great bonus feature by hitting three mermaids on the 1st, 3rd and 5th reel. 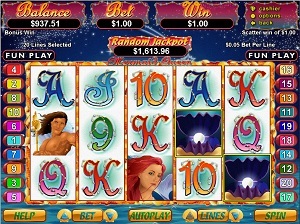 Mermaid Queen delivers a great looking slot machine with a fun and entertaining theme. The total composition of this Real Time Gaming slot gives a great impression and will surely make you want to dive into the deep blue sea and find a hidden treasure or two. The overall colouring of the Mermaid Queen slot is different shades of purple. It’s a nice looking slot machine but one would think that it appeals more to the female side of the population. The designs of the symbols are all pretty detailed without over doing it. The sound of the spinning reels that is so typical for slots developed by Real Time Gaming gives a good gaming experience. In certain symbol combinations, a musical score is added to the sound. This enhances the excitement of getting closer to hitting a big win on the reels. The main theme is an underwater world and this is very obvious in the symbols in this slot machine. All symbols are related to the sea in one way or another except for the lower paying one which are the card deck symbols of 10, J, Q, K and A. Apart from these, you will see the male mermaid, aka the merman, fishes, shells and pearls in different forms. The wild is the Mermaid and she’ll substitute for all other except for the scatter. The scatter is the Pearl-Clam which is multiplied by the total bet. Here’s a tricky one; the wild (mermaid) triggers the bonus game instead of the scatter which usually unlocks bonus features and such. The wild can only appear on the 1st, 3rd and 5th reels. The free game feature is triggered when you manage to hit all three reels with the mermaid. When this happens, you will be rewarded with 10 free games. These can also be re-triggered while playing the feature but it’s only your first 10 free games that are doubled in value. Every scatter symbol that might appear on the reels during the free games gives you one extra free game. Mermaid Queen has 5 reels and 20 lines to bet on. You can easily configure your betting preference if you click on the Line button in the lower part of the game window. The minimum bet per line is $0.01 and the maximum is $5. Mermaid Queen also has an auto play function which is very easy to use.